Please make sure that teams and supporters pick up any litter left on the pitch and surrounding areas. Please note that Council Staff have authority to declare pitches unplayable at their discretion on Saturday or Sunday if weather conditions have deteriorated since the previous Friday when the pitches may have been declared playable. 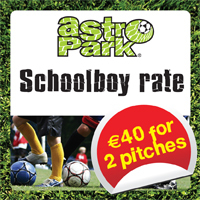 If you’re looking for training midweek – Contact Astropark for Special Deals. Brand new 5th Generation artificial turf just installed in Coolock (suitable for plastic studs). Royal Hospital, Donnybrook, Dublin 4 ? ? Alexandra College, Milltown, Dublin 6 ? ? Merrion Cricket Club, Anglesea Road, Ballsbridge, Dublin 4 ? ? Celtic Park, Beaumont ? ? College of Surgeons ? ? Ashbourne Community Centre ? ? Corduff Sports Complex – All Weather ? ? Dunshaughlin Community Centre ? ? McGlew Park, Athboy Rd ? ? Oscar Traynor Road ? ? St Ita’s Hospital ? ? Whitecross Primary School, Julianstown ? ?